Born in London Eve Kirk studied at the Slade School of Fine Art between 1919 and 1922. She became well known for her oil paintings of metropolitan scenes and urban landscapes of which she created two for Shell, ‘Strand on the Green, Chiswick’ and ‘The Liffey, Dublin’. 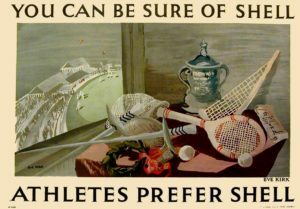 Although Kirk was also known for painting portraits she chose to paint a still life for the ‘Athletes Prefer Shell’ which was part of the People Prefer lorry bill/poster series. By 1932, Eve was exhibiting in group exhibitions with John and Paul Nash (both artists in our collection). The Scotsman reviewed the Contemporary Art Society exhibition at Tooth’s in New Bond Street, London and admired her ‘knife-painting of “The Thames, Wapping”‘ alongside work by Ben Nicholson and Sickert. 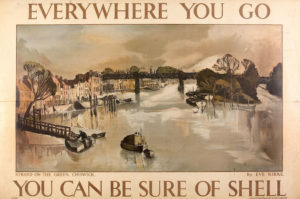 During the Second World War Kirk continued to paint whilst working for the civil defence in London. 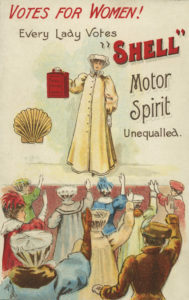 She exhibited at the Royal Academy of Arts her painting ‘Bomb Damage in the City’ as part of the 1945 National War Pictures group exhibition. In the mid-1950s Kirk emigrated to Italy and ceased to paint, dying in Siena in 1969 at the age of 69. Works by Eve are held in public collections such as The Tate, The British Council Collection, the Arts Council Collection and Imperial War Museum amongst others.